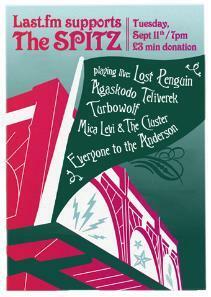 As part of the ongoing campaign to stop music venue The Spitz closing down, everyone's favourite geeky toy last.fm are getting involved with a special support gig tonight at the venue. Last.fm founders Felix Miller and Martin Stiksel are ex-promoters at the venue so throwing a fundraiser with some high charting last.fm new talent seemed like a perfect idea.
. Hot Chip will be taking to the decks and playing a selection of tracks that are high on the charts of last.fm users who have said they are attending the event. Neat. It's £3 in and you can register your attendance (if you're a last.fm user) right here.